Play computer audio and video on your HDMI equipped HDTV. 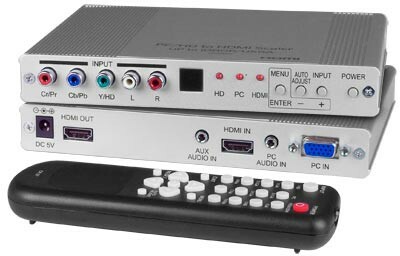 HDMI input and output are both HDCP compliant. One female Type A HDMI connector for HDMI input. One female Type A HDMI connector for HDMI output. One set of RCA audio jacks (R&L). Supports 480i, 480p, 576i, 576p, 720p, 1080i and 1080p for HDTV displays. Supports up to 1920x1200 resolution (WUXGA) for monitors.